I won’t even beat around the bush, these are just hot wings. Don’t be deceived by the name (although Wing King had to see about the King of Wings). These are not some “let’s go get some wings!” wings. These are wings that you eat about a hundred of, while watching a game, all the while not really remarking about the wings – but wanting (needing) a little more of that buttery spicy flavor in your mouth. There are no bells and whistles; the service was not even good. At best, they are a very clear testament to the value of fried salty food with sauce on it. They might hit the spot (on the late-night food/drink binge) but there are many other places with comparable wing options (mostly at around-the-way pizza shops). Though we were content after throwing them into our bellies, we had to give these wings 2 BigBite Bites = “Only when I’m drunk” on the 12 DAYS OF WING KING rating system. 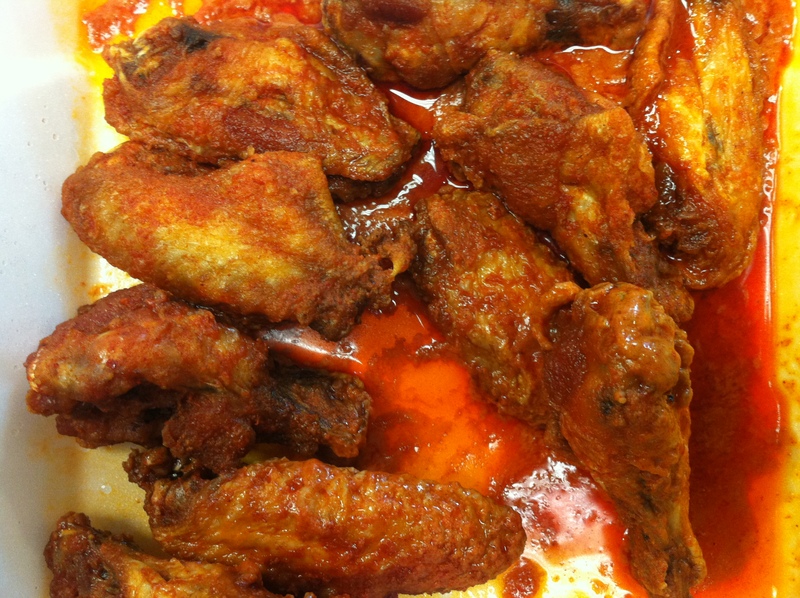 This entry was posted on Thursday, August 22nd, 2013 at 11:35 am	and tagged with Review, Wings and posted in Bite This, Review, Wing King. You can follow any responses to this entry through the RSS 2.0 feed.